I was pretty excited for today’s banding at the South Loop. I’ve been routing for Helen and Mr. M. to find a good nest since they lost their very first egg off the roof of the museum in 2007. The folks at 1130 S. Michigan have really taken their role as falcon hosts to heart, doing everything they can to help the pair raise their second batch of chicks this year and looking towards the future with the hopes that they’d make it a permanent home. They’ve been amazing to work with and as accommodating as one could hope for. By next year, in fact, the South Loop falcons should have a nest box to go along with the snazzy web cam! We’ve gotten to know the humans of 1130 and I like every single one of them a great deal. So, when they brought up the idea of supporting Chicago’s own Blackhawks hockey team (currently playing for the Stanley Cup) by naming the chicks after players and wearing ‘Hawks garb for the banding pictures, we were MORE than happy to comply. The banding went very smoothly. We had about 10 guests and Isabel came along to help out before returning to Texas. 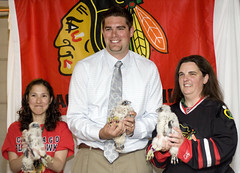 The building decided to name the lone female chick “Buff” for Blackhawk Dustin Byfuglien. If Mr. Byfuglien ever catches wind of this, I hope he isn’t offended that a girl got his name. As one of the more fearsome and large Blackhawks, it only seemed fitting that the much larger and much stronger female should have his name. The two males were named “Toews” (for team captain Jonathan Toews) and “Kane” (for Patrick Kane). With any hope, this brings luck to the ‘Hawks, courtesy of the Falcons! ~ by Steph on June 7, 2010.